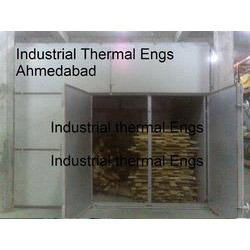 Manufacturer of a wide range of products which include heat treatment wooden pallet plant, wood heat treatment chamber plant, hot air wood dryer, thermal heat plant, wood heat treatment plants and forced hot air treatment plant. 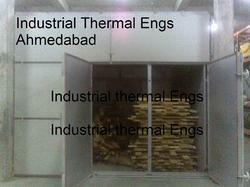 We are manufacturing and supplying Heat Treatment Wooden Pallet Plant as per customer need. Our plant are working in Africa, middle east and Malaysia. Our above 100 plants are working in India. The concept of Global quality pursued by constant research for the most reliable materials, simple and precise drive and control electronic system for seasoning cycle with personalized programs, give ( manufacturers ) Users top level standard as for production and quality as well as reproducible results having consistent quality. Equipment for seasoning chambers are made out of best quality of material like MS steel Sections. Heat transfer grade steel tube fin tubes type heavy duty heat exchangers suitable to use steam, Thermic Fluid Oil system, hot or superheated water system. • The Device for air circulation and replacement. • The cycle programming and control device. With strong commitment to quality, we are offering a broad array of Hot Air Wood Dryer to our honorable clients. The offered array of products is manufactured by expert professionals in strict adherence to the set industry norms and standards. Our offered products are available in various specifications to fulfill the needs of our clients spread across the nation. Apart from this, we are offering these products at nominal prices. Packaging Details: As per your need. 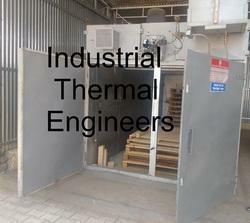 Owing to the years of experience, we are able to offer Thermal Heat Plant to our clients. The offered plant is designed using high grade material, procured from repudiated vendors of the industry. In addition to this, the offered array is checked on number of characteristics so as to ensure its compliance with the international laid norms and standards. Moreover, the offered range can be customized as the requirements of respectable clients. Which wood you want to do ISPM 15, Size of wood and relative humidity in wood? The Device for air circulation and replacement. The cycle programming and control device. All the parts and component of plants in special version are planned and manufactured to work at high temp. By following the ongoing market developments and trends, we are offer Wood Heat Treatment Plants to our valued clients. The offered plant is widely appreciated for its ultramodern techniques. Manufactured using premium grade basic material and top notch techniques, the offered array is available in number of designs, sizes and grades to meet the requirements of clients accordingly. We are readily engaged in offering Forced Hot Air Treatment Plant to our valuable customers. These plants are manufactured using quality approved material, bought from authentic vendors of the market. Offered plants are made by employing latest technology by experienced professional as per set industry standards. Along with this, the offered product is widely appreciated in the industry for its longer service life and high comprehensive strength. Backed by a team of dexterous experts, we are engaged in providing a high quality Heat Treatment Wooden Pallet. The adroit personnel design this plant using high quality components and modern technology with follow industry norms. The provided plant is available in various customized specifications and options. Also these products are avail to clients at reasonable priced. We are using best heating system and data logging system as per ISPM 15 and IPPC Standard. We have heat Treatment plants are working in Middle east. 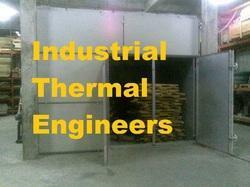 In our Heat Treatment plant working cost is 7- 8 Rupees per Pallet. Total cycle time is 3 to 4 hours. In our Hot Treatment Plant Chimney will not be there, so Clearance from Pollution control department will not be applicable. In our Hot Treatment plant you may not required any pollution certification as our heating system follow European standards and electrical protection IP 55. 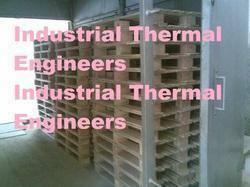 Low cost heat treatment plant for wooden pallet. If you have require Low cost Wooden Pallet Heat treatment Plant for wood Packaging material as per ISPM 15 for that please specify following things. We supplied above ten heat Treatment plants in Middle east. In our Heat Treatment plant working cost is 5- 6 Indian Rupees per Pallet. In our Hot Treatment plant you may not require any pollution certification as our heating system follow European standards and electrical protection IP 55. In Impregnator squeezing assembly should Steel to steel or steel to rubber and it should be pneumatic or manual. Highest Capacity – Maximum Economy operating speed from zero to maximum by infinitely variable speed hydraulic gear, controlled by a servomotor from the entry and exit of the machine. Variators for compensating any lengthening or shrinkage of the web during impregnating and drying. Electrical equipment with all accessories housed in a separate switch cabinet; controlled from various switchboards at the machine. Twin Unwind – fixed in succession for continuous operation when changing the rolls, at highest speeds in special “Non-stop” design. Universal impregnating device with heat able through, with level regulation, all rollers driven and carried outside the through, resin circulation by a special pump. All parts can be cleaned very easily. Special design of impregnating device for one-side reinforced and for only one-side resin pick-up; likewise “Reverse-Roll” coating device or air-knife; equipment with divided and additional vat, pre- und intermediate drying, doctors or the like, single or in combination. Dryer, subdivided into compartments, enabling the adaptation to any desired production; later extensions also possible; heating by steam, hot water or thermo-oil; contact-free drying or air cushions and absolutely uniform drying by means of symmetrical drying system. Impregnating machine for melamine and phenolic resin with universal impregnation device and dryer. Each plant is designed to give bare minimum utilization of resin to give best possible quality. Perfect alignment and leveling of each component if each individual unit has been done to improve quality of finished products and increase productivity and eliminate seconds. Industrial Thermal Engineers is distinguished by a record of stable, mutually profitable relationships with customers, and our inflexible commitment to delivering on time in each of the markets we serve. With the economies of scale our global reach affords, come unique responsibilities to our customers & to the communities where we do business. Our priority is to provide personal service, combined with the latest technology to successfully fulfill the needs and objectives of both the seller and buyer. We strive to build long lasting relationships with past, present, and future clients, and business professionals. We conduct these services in a professional, ethical, and timely manner. We always seek a level of operation whereby services rendered are carried out professionally and efficiently. Our goal is to keep abreast of latest technology, newest marketing techniques, & industry standards while striving to provide the highest quality service. 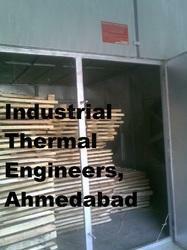 Our wood heat treatment systems are strictly follow norms of ISPM 15 and IPPC. We are offering world best heating system. It will under norms of pollution control board. so we are offering system under pollution norms. We are offering system in which you can forward the trail temperature data to your importer. 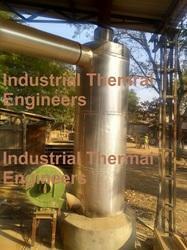 We are offering oil / gas fired heating system. If you have require Heat treatment Plant for wood Packaging material as per ISPM 15 for that please specify following things. Total cycle time is 2 to 4 hours. Looking for Wood Heat Treatment ?